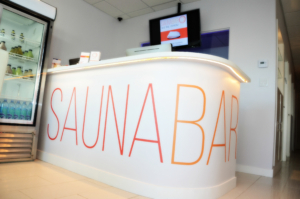 Welcome to SaunaBar, your one-stop destination for holistic beauty. Now open in Brentwood, we offer the latest in Holistic Detox Technology. This includes Infrared Sauna, Lymphatic Massage, and Magnetic Resonance Therapy. What exactly do these do, you may ask? We’re happy to share. If you read beauty publications, you know that Infrared Sauna is hot. It’s the biggest holistic discovery to hit the scene since green juice. Why the hype? The evidence is in the results. After just one session you’ll feel the serene effects. At SaunaBar, two forms of Infrared Therapy come together with 440 jade stones to restore your body inside and out. Cleansed and renewed skin, a detoxed system, and far less stress is what you can expect on the other side. Fabulous, right? 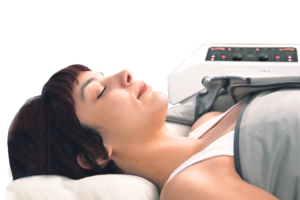 Done on a regular basis, Infrared SaunaPod sessions can transform your life. If you find that you need further evidence, we can provide it. A-List Celebs feel strongly about these sweat sessions and they’re happy to talk about it. Jennifer Aniston, Gwyneth Paltrow, and Cindy Crawford are just a few. In fact, one of our recent Transformation Weight Loss Clients did just that. She decided this restorative, stress-reducing therapy needed to be in her life, daily. It’s that good. The creators of the Magnesphere combined pioneering concepts from Albert Einstein and Nikola Tesla. The concepts we’re referring to involve Energy Work. You’re no stranger to it if you live in Los Angeles! From Reiki to Crystal Healing, millions have tuned in to this exciting frontier. With good reason (it works). 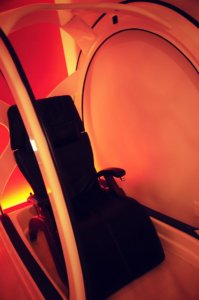 One session in our Magnesphere will re-align molecules throughout your entire body. This helps reduce pain and stiffness. In addition, issues that include stress damage, anxiety, and sleeplessness are addressed. Upon completion of your visit, you can expect to feel as if you napped for 3-4 hours in the mountains. Incredible, we know. Time and time again we have clients stop in for just over an hour to re-calibrate their entire day. Walking in they’re feeling the stress of being a wife and mother (if not a CEO as well). Walking out they feel beautiful, renewed, and ready to handle the day with ease. Book your appointment today and experience the transformation. At SaunaBar our goal is simple: we want you to shine — on the inside and out!